FULTON HOMES presents 16 questions you should ask before you buy a new home. . . Regardless of where you buy your home, getting the answers to the questions in this guide will help ensure you make the right decision. Finding just the right home can be tedious and confusing. This guide is developed as a tool to assist you, the home buyer, in your selection of a new home builder. We hope it will make the process pleasant and simple so you can feel confident about your new home decision. How to use this guide. . .
Review all the questions in this guide before visiting each builder. These questions were designed to be close-ended. Listen for a simple "yes" or "no" then be silent; listen to what comes next. Request copies of any documents used to support the sales associates’ answers to these questions. Carefully review each document. Take note of any verbal statement or visual information that catches your attention. There are sections throughout the guide for taking notes which will refresh your memory as you make your final comparison later. Compare all the information you have assembled and select the home builder you trust the most. Fidgeting and/or stumbling over answers is a sign of nervousness. These are basic questions. Knowledgeable, truthful and caring sales associates should not have difficulty answering any of them. Chatter. Sales associates who do all of the talking may not be genuinely concerned with what you want and need. Remember, they are there for you, not the other way around. Lack of support documentation. The sales associate should be willing to assist you in your quest for answers. This includes providing you with information and/or documentation. Avoiding or denying documentation is a sign your sales associate may be deliberately attempting to deceive you. Click a question to begin. . . Question 1: Are you public or private? For those builders that are public, bonus checks are often written based on the number of homes they close each quarter. Public builders have been known to close homes before they are complete or with many uncompleted walkthrough items just so they can make their quarterly numbers and secure lucrative bonuses. Are your investment dollars supporting local businesses or subsidizing a national company with headquarters outside the county or state? Living, working and being involved in the local community fuels timely customer service, our economy and a sense of pride. We live, work and socialize in the same networks as our home buyers. This self-appointed accountability makes us more responsive and instills a greater sense of pride in the homes we build and the customer service we offer. Question 2: Who will be performing the final walkthrough on our home before we move in? One easy way for a builder to save money is to cut back on customer care staff. Instead, they let the construction department take care of the final walkthrough and/or any issues you may have once you have moved in. The project manager who built your home has a natural bias when reporting walkthrough items. Any mistakes or shoddy work would be his own. Is he willing to report everything with 100% transparency? It’s a concept we call the fox guarding the hen house . Fulton Homes has a separate Customer Care department that accompanies you at the final walkthrough, giving you a fresh set of eyes to identify any issues with your home. This is a separate division of Fulton Homes that does not answer to the construction division. Customer Care will coordinate the completion of all your orientation items and will be there for you throughout your warranty period. Question 3: Can I track my warranty request items and see projected completion dates? Once you submit a customer service request, wouldn’t it be nice to follow the progress of the repairs without making a phone call? While most builders allow you to submit warranty requests online, Fulton Homes uses a web-based system for reporting and tracking all warranty requests. This system allows the homeowner to see when and what items need to be corrected, as well as the completion dates. Question 4: Can I visit your Design Center before I buy? We are not aware of any builder in town that will allow you to visit their design center unless you first buy their home. What are they afraid of? What are they hiding? Don’t you want to know the full cost before you sign a contract? Fulton Homes has a 13,000-square-foot design center located in Tempe; the largest Design Center in Arizona. The Design Center is staffed with highly trained professional designers who will help guide you through your selection process. We invite prospective homeowners to Browse Night™ , a Design Center open house for buyers who have not yet purchased a new home or made their design center appointment. With the amount of options available, our home buyers enjoy being able to preview the products in a more hands-on, casual atmosphere. Question 5: Can I design my home online? When buying a new home there’s nothing worse than going to a Design Center appointment unprepared. Before setting foot in the Design Center, browse hundreds of floor plans and thousands of options online from the comfort of your home. Then you can show up to your Design Center appointment relaxed and prepared to make the rest of your design decisions without feeling stress or pressure. Question 6: Do you have a sales manager? Most home builders have a hierarchy of sales teams and managers similar to what you might experience when buying a car. The person you’re talking to often has to pass details by a sales manager for approval. Having a sales manager is just another layer of red tape that slows down the process, making it hard for you to get the answers you need. It simply isn’t necessary. Fulton Homes has no sales manager position. Each sales associate has autonomy to make decisions and resolve issues that may arise during the entire buying and construction process. Each associate has direct access with Fulton Homes’ senior level management team, including Mr. Fulton himself. This fosters an environment where each sales associate has a vested interest in taking extra care of you from start to finish. This management structure allows sales associates to make decisions and resolve customer issues without delay caused by additional layers of management. Question 7: How long have you worked for your builder? It’s not uncommon to meet sales professionals who have been with the company for just a couple of years. Many are constantly searching for a better company offering more flexible terms or working conditions. The average tenure for a sales associate at Fulton Homes is 16 years , unheard of in the industry. Our sales associates stay longer because they’re happier. It’s an indicator of loyalty, confidence in the product they represent and the integrity of the builder. Question 8: How do I keep track of all my documents? The buying and building of a new home is sometimes confusing. It contains mounds of paperwork, many appointments, deadlines and meetings. It can be overwhelming to say the least. Every Fulton Homes buyer is issued access to their password-protected My Fulton Home web site. This web site contains all of your contract documents, including community documents such as CCRs, bylaws, landscape guidelines, construction schedules, selected options, warranty information, warranty registration for appliances, interactive personalized floor plans and more. You will have several meetings with the project manager, including pre-construction and again before drywall is installed. The sales associate is in close contact with you throughout the entire process while your new home is being built. Question 9: Does your builder support local charities? While other builders may support charities, you might wonder to what extent and where those charities are located. In fact, they may not support local charities at all. Fulton Homes has donated more than $300 million of their profits to various local charities, with a primary focus on education and water safety. Ira A. Fulton has been listed in Business Week Magazine’s top 50 philanthropists in the United States. When you buy a Fulton Home, you’re not only supporting local business, but also local charities as well. Question 10: Do you back roll your exterior paint? Most builders spray a wafer thin application, barely covering the stucco. In fact, it’s not uncommon to see the gray stucco still showing in the stucco voids of their homes. At Fulton Homes we are proud of our high construction standards and our quality trade contractors. Question 11: Do you prime your stucco before you paint? Absolutely. Before we apply an ounce of paint, we prime your stucco with LOXON® by Sherwin Williams. This gives you a smooth, longer-lasting paint job that won’t flake off. LOXON® is an expensive material that requires a great deal of labor, which is why most builders avoid it. And even fewer of them include it in the price of their homes. Question 12: How can I find your communities that are 5 to 10 years old? When it comes to resale value, many factors come into play. For example, is the community jam packed with lots? Take a look at the community amenities like aquatic centers, water features, parks, landscaping, schools and community pools. These all have a tremendous impact the future value of your new home. Our communities stand the test of time. After 40 years of experience, we’ve learned what matters most to home owners. What other builders see as "even more lots to be sold and profit to be made," Fulton Homes sees as room to breathe and play; an essential part of how you live. All communities look great when they are first built, but go take a look at how they have stood the test of time. Drive around other builders’ communities (if you can find them) and then drive some of ours. We’re proud of all our communities. We even provide a link on the home page of our website so you can see a full list of all 30,000 homes we’ve built throughout the Valley. You’ll find locations, number of homes and the year completed. What other builder is that confident in their communities? After all, you’re not just buying a home, you’re becoming a part of a neighborhood. Question 13: Can you explain your internal inspection policy to me? Following building codes during the construction process of your new home is the bare minimum required by law. At Fulton Homes not only do we adhere to all Federal, State, and local building codes, we have an internal quality inspection system all our own. This unique set of inspections is overseen by the elite C.O.R.E. Management Team and only comes with a Fulton Home. Inside your electrical panel of your new home you will find a sticker that is personally signed seven different times by multiple individuals who are tasked with delivering you a quality home. We can’t make it any more bullet proof than that. Question 14: What features are included in the base price of your home? Standard features vs. optional features included in your new home can add up to thousands of dollars in extra cost. Fulton Homes includes many features in your new home (see inside back cover) that other builders charge a premium for. These extra features can add up to thousands of dollars of savings for you. For example, Fulton Homes includes high-efficiency 16-seer air conditioner units at no extra charge. Two-tone paint is another expensive upgrade at other builders. Take the time to sit down with the sales agent and understand exactly what comes standard and what upgrades will cost you thousands of dollars extra. You might have to dig a little here, but it will be worth your while. Question 15: Who is your biggest competitor? When you ask this question, if you sense any hesitation, it’s because they don’t want you to know where else to look for a new home. They’re too afraid of losing your business. Fulton Homes welcomes competition because we are our own biggest competitor. We often hear from prospective buyers, "We are going to buy a new Fulton Home, our toughest decision is: which community?" We commonly have multiple generations of homeowners purchasing our homes. Home buyers who grew up in a Fulton Home and wouldn’t think of purchasing from any other builder. Question 16: Are your homes Energy Star and Indoor airPLUS certified? These days, it’s not uncommon for builders to be Energy Star certified. And we all know how important energy efficient homes are. But few pay attention to Indoor airPLUS and why it’s important. Why? Think about it. What builder wants to deal with yet another set of pesky Federal standards and regulations when they can save the money and headache? We do! Fulton Homes is recognized by the U.S. Environmental Protection Agency and the U.S. Department of Energy as partner of the year sustained excellence. In fact, we’re the only builder ever to receive both the Energy Star’s Partner of the Year (4 years) AND the Indoor airPLUS Leader awards... three years in a row. Indoor airPLUS and Energy Star certifications are a big deal! In a nutshell, we have features that allow for clean, fresh air to be funneled into your home. It means a healthier, more cost-efficient home for you and your family. If you’re curious to know more, ask us- we’ll answer all your questions. What else should I look for in my homebuilder? Look Around - Drive through the entire community. Note the cleanliness of the job sites, the level of productivity and the maintenance and upkeep of the common areas. REMEMBER, this may become your backyard! Back Rolled Paint - The paint finish on many new homes is often just sprayed on. Back rolling in addition to spraying provides a multiple-coat finish, and helps eliminate visible gray stucco areas and prevent fading. Drive the Whole Community – Is your community designed as a neighborhood or a grided-out subdivision? Was the builder more interested in how many lots he could squeeze onto an acre or how the community will live once completed? Look around, do you see open space, parks, ramadas, BBQ pits, playgrounds, basketball, pickle ball, horseshoes or bocce ball courts? How about an aquatic center? Clean Job Sites - Construction sites should be clean and free of debris. Messy job sites often lead to poor care and attention to the quality in construction of the new home. If workers don’t care about their environment, chances are they don’t care about your home. Past Communities - Visit an older, more-established community by the same builder in a similar price range. You’ll gain a feel for how your home and community will look down the road. Buying a home is a long-term commitment; you should feel comfortable that the future looks bright! Our past communities can be found at: FultonCommunities.com. Internal Quality Control - Homes under construction should have some measure of quality control before completion. This unique set of inspections is overseen by the elite C.O.R.E. Management Team and only comes with a Fulton Home. Inside your electrical panel of your new home you will find a sticker that is personally signed seven different times by multiple individuals who are tasked with delivering you a quality home. Due Diligence - Contact the home office, construction superintendent, existing homeowners, or others you feel may impact your decision of where to purchase. This will provide an indication of the “company-wide” commitment to customer service. Quality home builders should be happy to address your concerns. Ask these difficult questions of each home builder you encounter. You will have a much clearer view as you move forward on the purchase of your new home. As Arizona’s largest family-owned and operated home builder, we feel confident we can answer your questions and concerns far better than any other builder. We strive to provide the best quality, value and customer service. Our legendary Fulton quality comes from the location and standards of our communities, the remarkable design and construction of our homes, and our relentless concern for our home buyers. 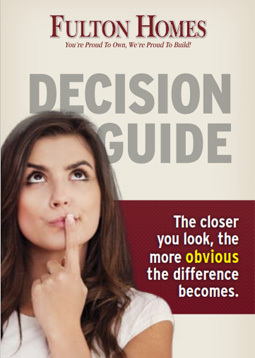 We hope this Decision Guide is helpful in your search for a home. As you gain the knowledge and information needed to make your decision, we are certain you will return and make FULTON HOMES your home builder.